Facebook's kicking its video chatting game up a notch, making it easier than ever to dial up a friend via the service's built-in chat tools. And who's to blame for the quick tweaks? Likely Airtime – the launch of the "New Chatroulette," as some have pegged the service, seems to have lit a fire under Facebook's feet to get its own video chat services better established among its user base. 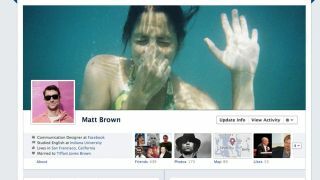 Here's what's new: Facebook's added a brand-new "Call" button to everyone's Timelines. Click on "Call" and up pops your video chat – it's that simple. The caveat with the new button is that it only appears if your friends are actually logged in to Facebook chat when you click on over to their Timeline profiles. If so, you'll see the button appear between the standard "Message" button and gear icon, representing one's Settings drop-down menu. It's a far more elegant solution than the old method of video chatting with one's friends, whereby a Facebook user had to first open up a chat window with a friend by clicking on their name within Facebook's right-hand sidebar. From there, you'd have to click on the tiny video camera icon to fire up Facebook's video chat. Yuck. Facebook still hasn't unveiled a host of features that it brought up back when Facebook video chat was first officially unveiled in July of 2011, according to a TechCrunch report. Still missing from the picture is any way to have video within a group chat with one's friends (a la Google+ Hangouts), as well as Facebook-to-Skype video calling or some kind of mechanism for making outbound calls to real-life phone numbers via Facebook. It's fair to say that Facebook's chat features are a bit lacking compared to its peers. While the service's Skype integration was seen as an interesting start to a new future in social network-driven conversations last year, it doesn't appear as if Facebook has really done much to expand its chat services to better compete against the different competitors now eyeing the space. If social video chatting is your thing, Google+ Hangouts offer a fairly compelling experience. If you want to chat with strangers – but still stay connected to Facebook, so you can more easily reduce the number of naked people in your experience – you go to Airtime. Aside from simple text-based conversations, and completely owning the social space, what does Facebook chat bring to the table? At least, now, Facebook's changes will help users better tap into video chats if they so choose – or remember that Facebook video chats even exist.